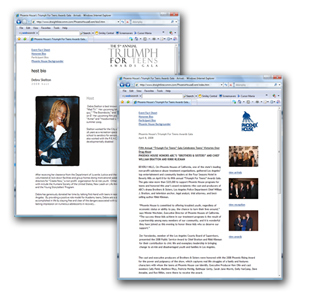 To publicize the Triumph For Teens Awards Gala, honorees, and celebrity participation as well as raise awareness about Phoenix House Raise and its important work in the community. Secure and manage a full press line for red carpet arrivals. Straightline Communications pitched prequel stories to create buzz and build momentum for press coverage at the event. We sent advisories and aggressively pitched the event, compiled message points for celebrities, compiled press kits and tip sheets. We established a central online pressroom to provide easy access to Phoenix House information, the event press kit, press releases, biographies and images. We credentialed and checked in press for red carpet arrivals, managed the press line and celebrity arrivals, as well as managed select media we allowed to cover the event. We secured a lively press line for red carpet arrivals that included MSNBC Entertainment, KABC-TV, TV Guide Network, TV Guide Magazine, People Magazine, OK! Magazine, Los Angeles Confidential Magazine, Los Angeles Times, and all the top photo agencies. Straightline Communications boosted photo placements in print publications by uploading images from the red carpet and event the same evening. The online pressroom as well as our post event pitching and follow up secured stories in top-level print and broadcast media.